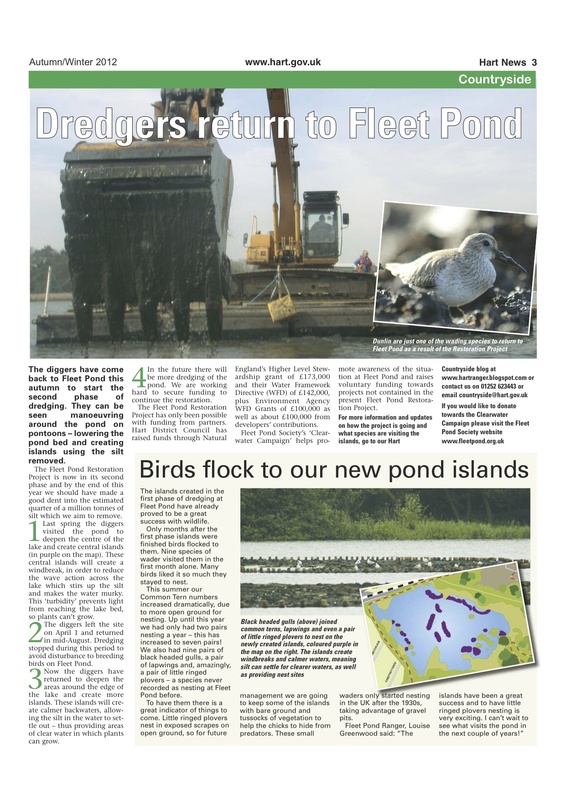 Questions have been raised by FPS supporters about the wording of the recent press release from Hart District Council concerning the return of the dredgers for the next phase of the Restoration Project. This unfortunately gives the impression that Clearwater Campaign funds are not part of the Restoration Project. This is, however, not correct. Clearwater Campaign funds are an important element of the Restoration Project because they will be spent on projects not covered by the funds raised by Natural England, the Environment Agency and Hart District Council. To give just one example, the Clearwater Campaign money will pay for the construction of an “aquatic nursery” in the southern section of the pond. An area will be separated from the main pond by a geotextile curtain and the larger fish removed and placed in the main pond. This will give aquatic plants and animals to thrive and be a “reservoir” of diverse flora and fauna to repopulate the main pond when water quality and clarity has been improved. Ed. We hope this clears up any possible confusion but if you have any further queries or questions, please leave a comment below. A digital version of Hart News can be found here, a hardcopy version was also distributed within the district. 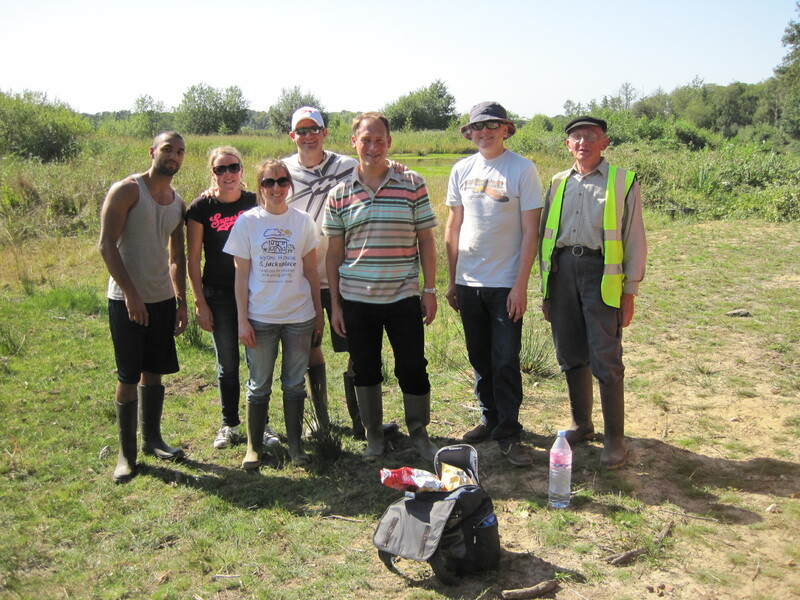 On Wednesday 5 September, a team from Virgin Media (based at Hook) visited Fleet Pond to help with our conservation activities. Being a small team which is pretty much office bound, we wanted a chance to do something more physical and in the fresh air for our annual volunteering day. 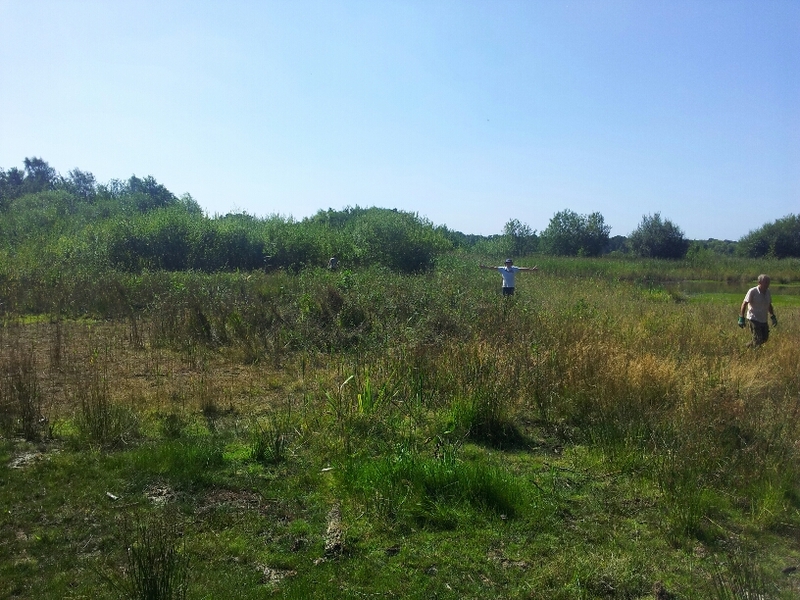 Well, we certainly had our objectives met when we went to Fleet Pond for the day! It was the first visit to the pond for all members of the team and I think it’s fair to say we were all taken aback, firstly by the size of the reserve and secondly, by the beauty and tranquility of the area. 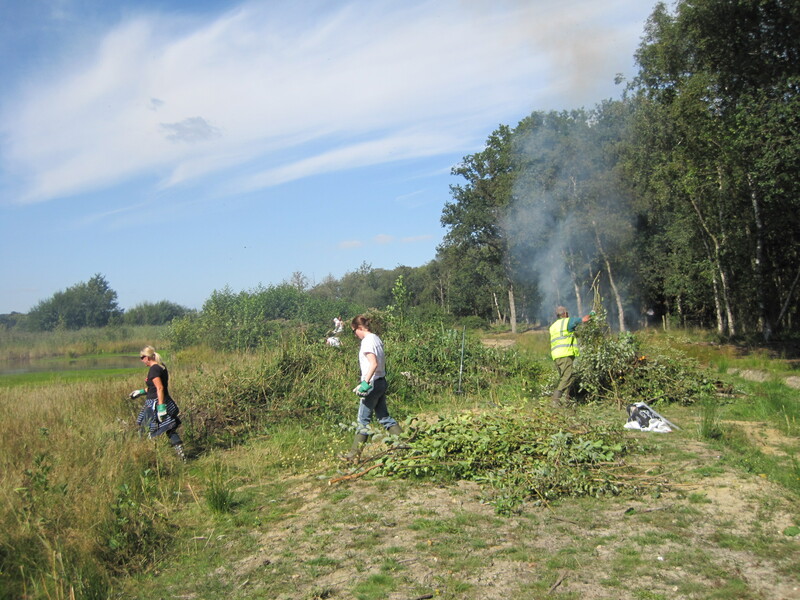 Colin Gray, Chairman of Fleet Pond Society (FPS), had already told us about the work that we would be doing; our task for the day was to lop down alder and sallow scrub that threatened to overshadow the more valuable marshland plants. We started to get a sense of the job on our hands as we watched Colin, Geoff Dee and Terry Austin (all from FPS) load the plethora of tools onto the tractor. It wasn’t until we got to the area we were working in (Coldstream Marsh) that we truly realised the scope of our challenge. As we stood surveying our new career for the day, I vaguely remember Colin saying ‘you see those trees in the background…..well, we need to get everything in the foreground down to waist level….’. Gulp….did we just hear that correctly??! And so we got stuck in, splitting into two groups to tackle two different areas. We were fortunate that the weather was kind to us – it was a beautiful sunny day and we were soon warmed up! Colin, Geoff and Terry got a bonfire going and whilst the boys in the team were enjoying using the array of tools (slightly worrying swinging of the scythes going on…), the two girls did the tidying up behind them, dragging all the cut branches up to the fire. With all the hard work came many required pit-stops for cold drinks, tea and of course biscuits and chocolates (the Virgin Media Procurement team doesn’t travel far without a regular food supply!). Us office workers were not used to burning off so many calories in one day and we had to take our hats off to Colin, Terry and Geoff – their energy levels far surpassed ours and by mid-afternoon, our aching muscles and scratched limbs forced us to admit defeat. Rough Indication Of Progress Made – From The Front To The Person With Arms Out At The Back! We all went home feeling tired and with the knowledge that we’d no doubt ache the next day, but it was a very satisfied feeling to know that we had a least made a small difference to the marshland. We thoroughly enjoyed our day out of the office and forwarded the details round to other teams – maybe with a few more teams, we can make it to those ‘trees in the background’! The bad weather during June, July and August of 2011 hit the butterfly population badly and, with the cold, wet and cloudy weather through April, May and June and the first half of July this year, some of the species next year could find their numbers at dangerous levels. To fly, all butterflies need solar power and, if there is lack of sunshine, they cannot spread their wings and soak up the sun’s rays to enable them to mate and reproduce. To see how badly they have been affected at Fleet Pond, I visited some of the areas referred to previously on a sunny Sunday (22nd July). The temperature reached 26C for the first time for a while and I was quite shocked at how low the numbers were! I started my trek from the new (old) bridge at Wood Lane and, on the Wet Heath, I only saw two butterflies: a Meadow Brown and a Large White. 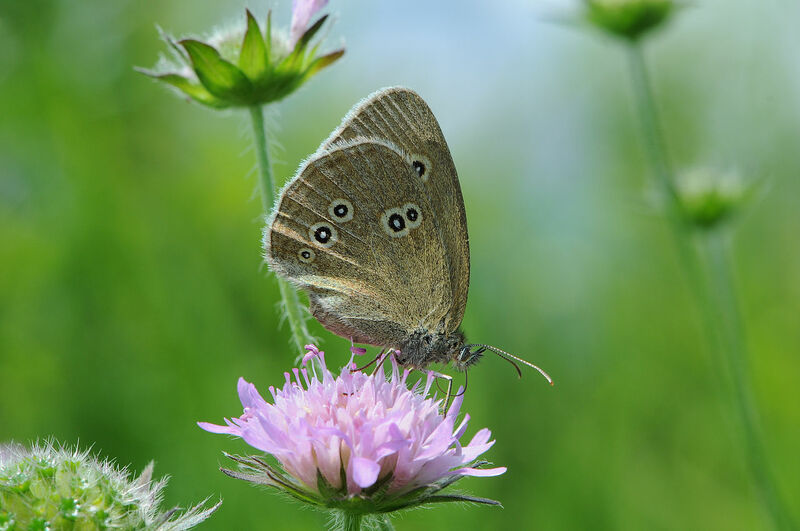 As I went along the path towards the field on Ministry of Defence land, where I had seen plenty of butterflies of various species in the past, I saw only 3 Ringlets. Part of the reason for such a dearth could have been the height that the trees and bushes had reached either side of the path since my last visit. There were very few places reached by the sun to encourage the nectar-producing flowers that used to be there. The Field was more promising, as I recorded five species there. There were 10 Ringlets, 2 Large Whites, 5 Large Skippers and 4 Small Skippers. Although their numbers were all down, the bright spot was seeing 61 Meadow Browns along the edge of the field. If I had walked the whole field, the number would probably have been in hundreds. Strangely, wet conditions seem to favour Meadow Browns. They normally vary considerably in colouring from pale brown to almost black most years, but this year, the majority seemed to be very dark. I went on the islands in the Car Park, where reasonable numbers of butterflies were seen in the past but only 2 Gatekeepers and I Meadow Brown were recorded there. It was my intention to go into the area between the path and the railway (opposite the Dry Heath) after that, but I was aghast to find how overgrown with trees and bushes it had now become. As well as other species, I had recorded up to 30 Gatekeepers there previously, so you can probably understand my disappointment at saying that the number seen on this occasion was nil. On the Dry Heath, I saw 1 Red Admiral, 2 Meadow Browns and 1 Gatekeeper. 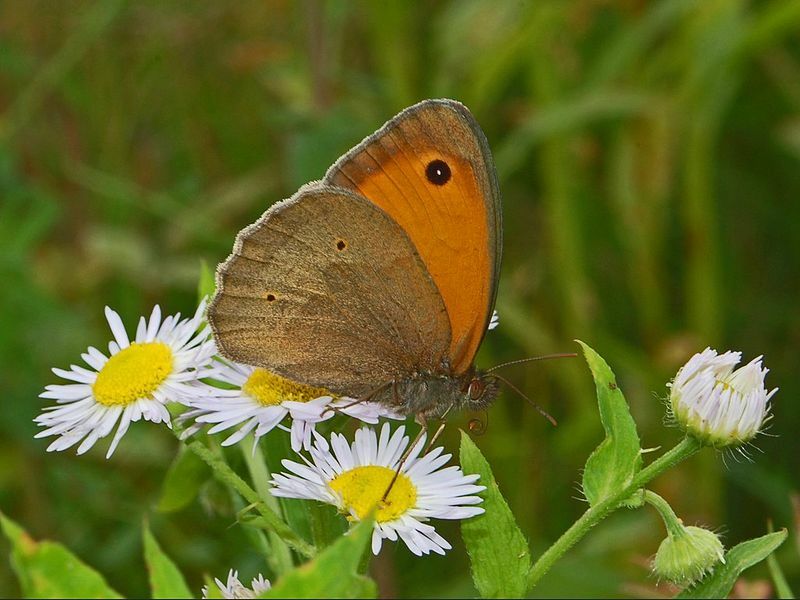 One of the Meadow Browns and the Gatekeeper kept flying round and round each other. Perhaps numbers were so sparse that they were both thinking of trying to mate with another species! 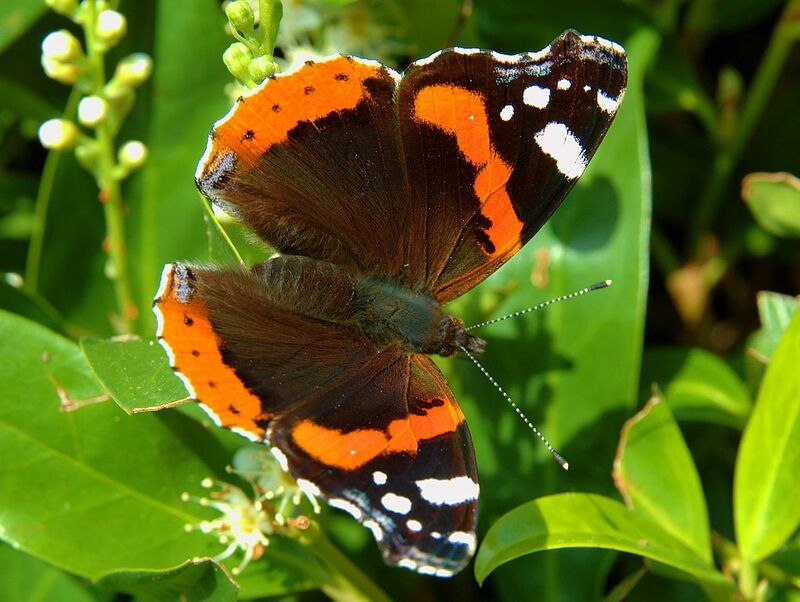 There is concern nationally about some butterfly species reaching near extinction levels in 2013. It is, therefore, very important to bring sunshine into what are currently dark and overgrown areas and we can all plant more nectar-providing plants in sunny spots in our gardens. Comment: Peter has previously written a very popular series of articles on the butterflies that can be seen at the Pond – see here. You are currently browsing the Fleet Pond Blog blog archives for September, 2012.